The best thing about Marmalade Toast, aside from it being a hidden gem in Orchard Road, is that the prices are affordable. It serves the same desserts as Marmalade Pantry, but at a lower price. I can’t remember exactly when they changed the interior, but the decor is now different. It has a yellow theme but it doesn’t matter since I don’t go there for the “ambience” anyway. I’ve always maintained that Marmalade Pantry has one of the best cupcakes in Singapore. Among the cupcakes ($4.5) there, my favourite is definitely the lemon cupcake. It is that good. I also like the William pear chocolate cupcake and strawberry cupcake. Some of the flavors like nutella, peanut butter and red velvet are too dry for my liking. For cakes, the chocolate truffle cake ($5.5) is good, but it is extremely dense, making it impossible to finish unless you share it with someone. The carrot cake ($5.5) is also one of the better ones that I’ve had before. The blueberry cheesecake ($5.5), as well as the pear tart, are some of the items that I always order. If you are a fan of lemon desserts, you must try the lemon meringue sponge cake and lemon tart. 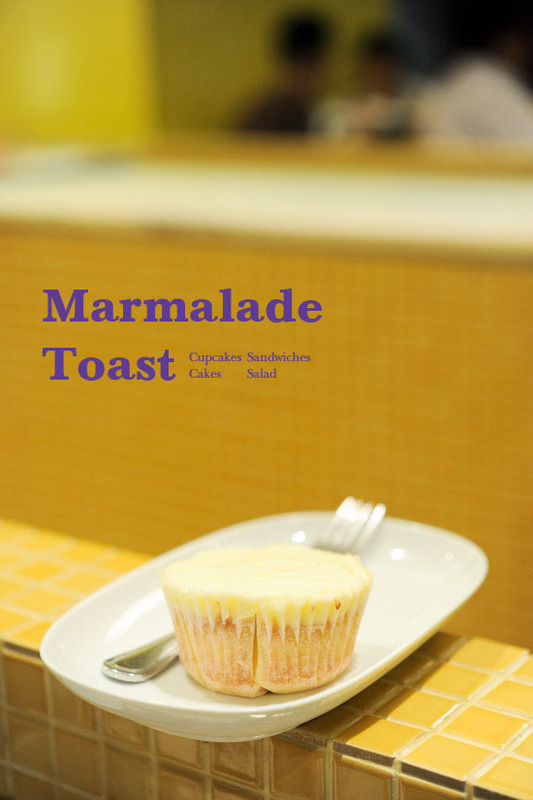 Marmalade Toast is my favourite cafe in Orchard road. It is the place that I go when I want a quiet space for a quick bite. Life is good when you enjoy a cup of tea, read a book and have desserts for a leisure afternoon high tea. Here’s the direction if you are wondering where it is: from level two of Takashimaya department store, walk towards the kinokuniya direction and look out for a “secret” pathway between Christiam Louboutin and Marc Jacobs. Have fun! Oh yes, I love this cafe and their food too! Oh no Toast will not be quiet any longer! where is it exactly in Ngeen Ann City on second floor?any other more popular shops nearby that I use use as a gauge, I was looking for it for 20 mins last time and failed miserably thanks! adel: It’s in the same block as Kino. Look out for marc jacobs? It’s quite easy to find. It’s actually at the back area, near the taxi stand, you should be able to see it from the main road. OMG, seriously I didn’t know that this cafe exist although I have always be in town like everyday. Thanks for the info, will definitely give it a try since I am a fan of marmalade pantry! if you liked that it was a hidden gem then why did you blog about it! now it’s not going to be a hidden gem anymore. this cafe is awful.fullof pretentious people. worse thing is, their staff are bloody racist: they prefer to serve and be nicer to caucasians rather than other Asians.